There’s an information war going on between advocates for timber, concrete and steel, and everyone is claiming their material is the best from an environmental perspective. Timber offers up its credentials as a renewable resource that stores carbon and has a variety of biophilia-related wellbeing benefits. Concrete points out it is not flammable, and that the industry is making strides in reducing its emissions and inputs footprint. Steel argues it is recyclable and can be used in ways that reduce the quantity of other materials required to make a strong building or bridge. Meanwhile, the new materials kids on the block such as bamboo, hempcrete, bioplastics, high-performance glass and lightweight metals like aluminium all present their own case for being the silver bullet for sustainable building. The Fifth Estate decided to fact check the claims and ask whether there are grains of truth in the PR walls being erected to protect industry market shares. Looking at timber, the hard fact is that Australia has not been taking steps to ensure a long-term supply of construction-suitable hardwoods and softwoods. According to industry experts including Braden Jenkin, part of the Next Generation Forest Plantation Investment project, the size of our hardwood plantation estate has actually been shrinking. 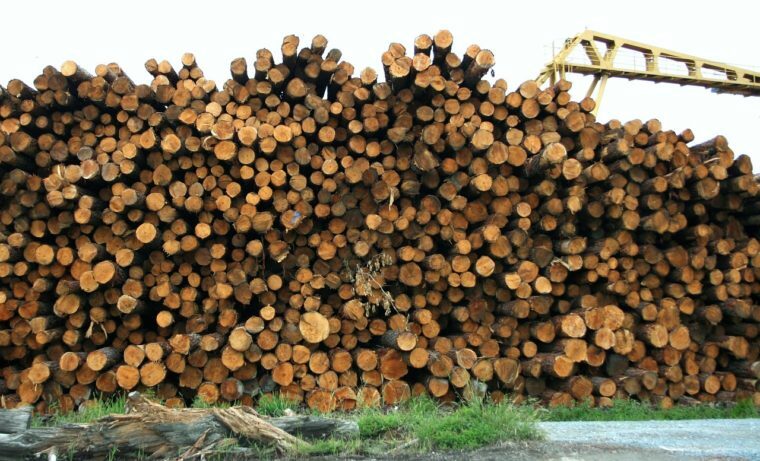 Australian Bureau of Agricultural and Resource Economic data supports this and reveals that of the trees harvested in Australia, the vast majority are sent offshore as woodchips. The research project is looking for the right policies and incentives to increase productive timber grown on farmland, as this would have multiple benefits for the broader ecology and ecosystem services of agricultural lands. “There is a large area of farmland in Australia where different types of planted forest could be integrated with existing agricultural land uses,” project leader Professor Rod Keenan, from the School of Ecosystem and Forest Sciences at the University of Melbourne, says in a statement about the research. Other researchers have pointed out that our state-owned forest estate may actually serve us better if it were priced for its carbon sequestration benefits – a move that would then take away many of the environmental concerns still being expressed by environmental groups. The management of state forests in both New South Wales and Victoria has been coming under heavy fire recently, due to the logging of habitat for endangered species including Victoria’s yellow-bellied glider and key koala habitat in New South Wales. A wise bloke once said not to build one’s house on sand, and while this advice has been widely ignored by many, it is something the concrete sector among others is having to come to grips with. We are now in the early stages of a global sand shortage, as not just any sand will do for use in construction. At the same time, the rampant appetite for sand is coming into conflict with other land uses, ocean and habitat protection and the rights and customs of communities in potential sand mining areas. The tiny island nation of Palau has been making the news due to this kind of conflict, with traditional custodians opposing a mage sand-mining project that will compromise customary subsistence fishing, water quality, endangered species and the littoral environment. One of the points raised in ABC Pacific Beat’s coverage of the issue was that the mining company is not likely to generate substantial returns for the Palau community or government, as large quantities of the sand mined are planned for use in luxury developments being constructed by an allied firm. Beyond sand, other environmental questions around concrete include its use of other non-renewable raw materials, and the energy footprint of its production. Quite aside from the use on non-renewable and rapidly-diminishing iron ore as a core feedstock, one of the major environmental flaws with steel production is its current reliance on coking coal to manufacture virgin steel. While the Carmichael mine Adani is attempting to push ahead with plans to extract thermal coal for energy generation, the almost as contentious mines to the south in the Bowen Basin are producing coking coal. It’s a footprint the industry has not yet managed to wipe out – and with global steel demand continuing to be strong, it is going to take the right market signals to get the sector to shift to a more planet-friendly process. There is good use of materials, and not so good use of materials, he explains. In recent lifecycle assessments he has worked on for construction projects the solution is to take best advantage of the properties of any material for a given situation. He says that while there is some “good conceptual thinking” around circularity and renewability in terms of materials, this is not the common conceptual framework being used for analysis by most projects. And when it comes to concrete, he says he is not sure what conceptual framework it could arrive at in terms of circularity or renewability. Timber, in terms of being renewable and a store of carbon is “interesting” but the industry as a whole in some ways “stole defeat from the hands of victory” over recent decades. It also has an image problem, being so familiar. Yes it is beautiful, and stores carbon and it’s renewable but it’s been around for a long time. “If we invented it today we’d call it the most amazing new sustainable biomaterial ever,” he quips. Instead it’s the manufacturers of products such as bamboo flooring taking centre stage as new and exciting, even though its production and eco credentials are not “that much different” from timber. These types of new products have “solved a problem we don’t actually have”. Overall, the industry has worked hard on its reputation and practices. Concrete, by contrast, hasn’t innovated much in terms of cement kilns. Grant says the sector’s main innovation is in the use of supplementary materials such as fly ash or waste plastics. There has also been momentum around design for concrete to make it as efficient as possible, for example the use of post-tensioning to reduce the volume of concrete and steel required for slab construction. Concrete is still a “great material”, he says, given it is versatile, its mechanical properties and its price point. An encouraging aspect of the industry is the shift to the use of concretes with 30 per cent supplementary materials in the middle of the market, not just at the premium Green Star end. When it comes to steel, he says the coking coal is the Achilles heel. There is at this point no commercial technology which is scalable to replace it in the blast furnaces that make new steel. The coking coal is not about providing energy, it is part of the chemical reaction that turns iron ore into steel. Even at a very high level of recycling we still need some primary steel, he says. That means we still need coking coal, until something shifts such as carbon emissions policies to incentivise the deployment and uptake of alternatives. Even recycled materials generally are not footprint-free, he says. “There are environmental externalities in renewable products and in recyclable products,” Grant says. While climate change is the top agenda item in terms of environmental challenges, Grant says there is “no point” in solving it if in the process we poison all the rivers and oceans. All climate change solutions need to take into account the land and water budgets. Land is good for sequestering carbon, for example, but to do so takes water. Using water for that means not having that water for other purposes. It is all interconnected, he says. Land, water and carbon are tradeable among themselves, and are all part of the same set of environmental constraints. Director of the Institute for the Development of Environmental Accounting and former head of the National Accounts Branch of the Australian Bureau of Statistics Carl Obst is recognised as a global expert in developing methods for accounting that integrate natural capital and environmental services. It appears it is only a matter of time before these ideas become part of mainstream thinking in Australia. Obst told The Fifth Estate that back in April this year, the meeting of federal, state and territory environment ministers agreed to start work on a strategy to develop a common national approach to environmental-economic accounting. There was no mass media release about the agreement, but Obst says the federal Environment Department is very engaged in progressing the strategy. CSIRO is also hard at work on natural capital accounting, he says, as are other world governments, the United Nations and some leading corporates. Already governments in the UK, Holland, Costa Rica, Uganda and South Africa are doing some good work in the space, he says. In terms of looking at construction supply chains through a natural capital or environmental accounting lens, Obst says that the fundamental thing about any supply chain is answering the ultimate question of whether or not it has natural resources at the end of it. If it is established there are natural resources at the point of supply chain origin – which is almost inevitable with most construction products – the issue then becomes to what degree they are managed sustainably, or if they are obtained from non-renewable extraction of resources. The advantage of the natural capital approach is it also takes a supply chain back to a geophysical location, he says. It is the sustainability of activities at that location that gets assessed. This analysis is based on risk assessments and management approaches, rather than the business as usual performance-based approach to asses natural resource use sustainability. An example of this in practice is a new element to the Forestry Stewardship Standard that is based on assessing ecosystem services such as water, biodiversity and soil. Obst says that while there are moves afoot globally to bring natural capital approaches into commercial thinking, for example the finance sector, going beyond emissions in terms of perceived environmental threats is “the next big task”. He says biodiversity is “the next climate change” in terms of an issue that could have global impacts. And just as it took a couple of generations for climate change to be generally accepted as a threat, there’s a lag factor at work in how threats to biodiversity are being understood and acted on. A difference between biodiversity and carbon emissions is biodiversity impacts can be linked back to specific spatial areas, Obts says. By contrast, carbon can be emitted anywhere and have a global impact, and it can be sequestered anywhere and have a global benefit. “The situation in terms of biodiversity is much more bespoke”. Another problematic aspect of the biodiversity threat is there is no way of knowing what the impact of dramatically reduced biodiversity might be – just as there was no way of knowing many decades ago what the actual and measurable impacts of climate change would be. The extent to which our existing biodiversity has a “resilience and redundancy capacity” is something we just don’t know. We probably won’t work it out until the divestment of global biodiversity has reached a critical point, Obst says. Like many things, the consequences of not addressing biodiversity loss are the things we didn’t see it contributed to our global habitat. Even though environmental accounting and natural capital approaches have benefits, Obst notes that accounting in and of itself is a tool – and having the tool doesn’t mean good decisions will automatically be made.